Though Los Angeles boasts sunshine and blue skies practically year-round, there is something extra magical about summer in L.A. What better way to embrace the season than by spending it outside? Read on for movie and TV locations that celebrate L.A.’s great outdoors. Paradise Cove as we know it today came to be in the early 1950s, when a man named Joe Morris purchased two adjacent parcels of land and combined them into 70 seaside acres, complete with a private cove, a pier and a beach cafe. Originally a fisherman’s hangout, the site gradually turned into a beachfront community - a place for local families, tourists and celebrities alike to spend a day by the sea. Joe sold the land and restaurant to the Kissel family in the 70s, a move that his son Bob never got over. In 1998, Bob returned to Paradise Cove and purchased his father’s former restaurant. He still owns the eatery, which he renamed Bob Morris’ Paradise Cove Beach Café. Paradise Cove has been featured in hundreds of productions over the years. The site’s most famous appearance was in 1993’s Indecent Proposal. Woody Harrelson proposed to Demi Moore on the pier at the beginning of the flick, and the two eventually reunite there at the end. 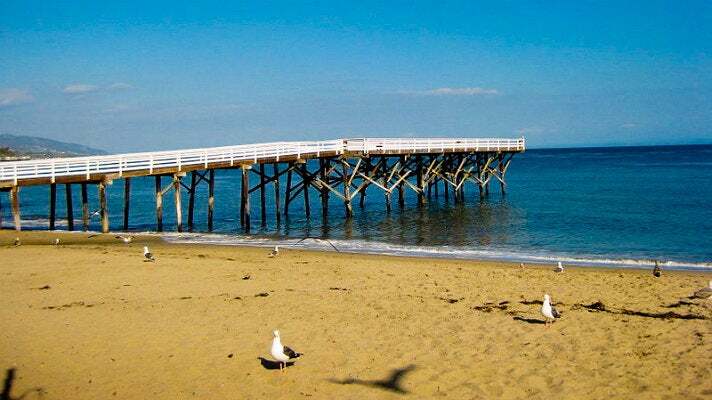 The Michigan lake house where Jim (Jason Biggs) and the boys spent the summer in American Pie 2 was actually a facade built on the shores of Paradise Cove, just north of the Beach Cafe. A fake lighthouse was also installed at the end of the pier for the shoot. Mel Gibson and Rene Russo’s home in Lethal Weapon 4 was also a facade built just north of the cafe. James Garner lived in one of Paradise Cove’s beachside trailers on the television series The Rockford Files, and the majority of Britney Spears’ 1999 Sometimes music video was also shot on the premises. What better way to explore Los Angeles than by horseback? 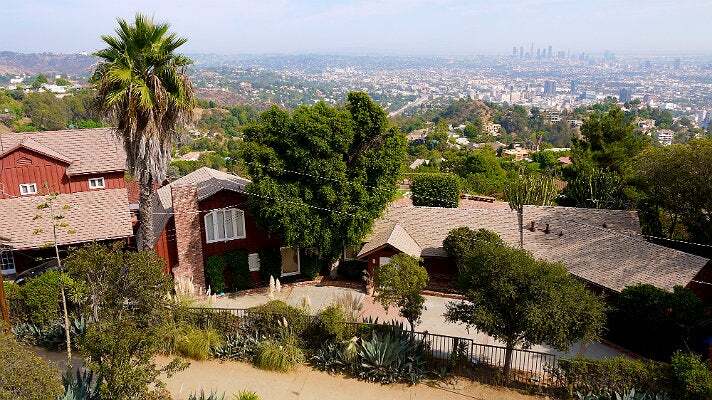 Sunset Ranch Hollywood is a 2.5-acre equestrian center that’s situated almost directly beneath the Hollywood Sign at the top of Beachwood Drive in the Hollywood Hills. The ranch was originally founded in Culver City by Julian Smith in 1929. When developers forced him out of the area in 1954, he began leasing, and eventually purchased, a horse ranch in Beachwood Canyon. The ranch was built in 1897 and served as the Hollywoodland Riding School for the Hollywoodland housing development. Smith’s family still runs the ranch today. 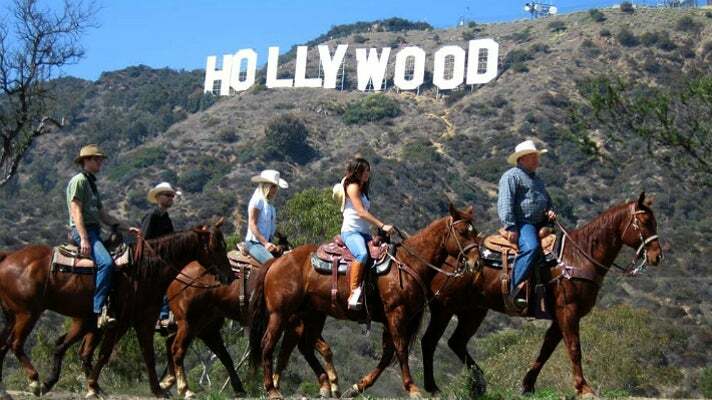 Sunset Ranch offers daily rides through Griffith Park and Mount Hollywood. Their most famous offering is the Friday Night Fiesta Ride, which costs $100 per person and is comprised of a four-hour, seven-mile evening tour through Griffith Park with a mid-ride meal stop at Viva Cantina restaurant in Burbank. Holly Madison and her friends take part in that ride in a Season 3 episode of the E! reality series, The Girls Next Door. 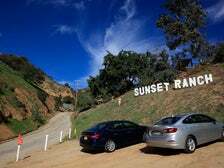 Sunset Ranch also makes a memorable appearance in David Lynch’s 2001 thriller Mulholland Drive - it's the spot where Adam (Justin Theroux) has a nighttime meeting with the mysterious Cowboy (Monty Montgomery). In The Music Box (1932), Stan Laurel and Oliver Hardy charmed audiences with their maddeningly futile attempts to deliver a piano up a steep flight of 131 stairs to the hilltop home of Professor von Schwartzenhoffen. The Music Box is still a fan favorite more than eighty years after the short film’s release. 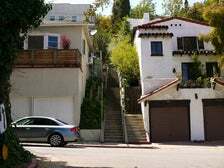 Though the von Schwartzenhoffen residence is said to be located at 1127 Walnut Ave., the Music Box Steps actually connect Vendome Street to Descanso Drive in Silver Lake. The Music Box was not the first time the comedy duo ventured up the sprawling outdoor staircase. Laurel and Hardy also attempted to deliver a washing machine via the same set of steps five years earlier in 1927's Hats Off, which is sadly a lost film. A plaque now commemorates the staircase’s filming history. Otherwise, it looks much the same today as it did when The Music Box was filmed, though the area surrounding it has been built up considerably. 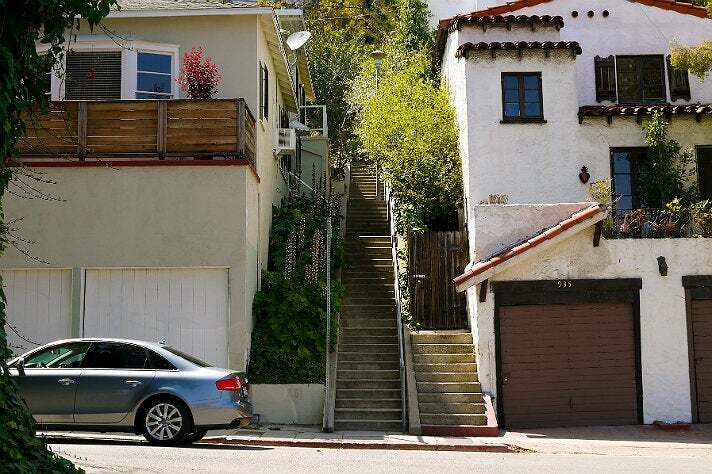 The Music Box Steps, along with several other Silver Lake area staircases, serve as popular exercise venues. Don’t go looking for the von Schwartzenhoffen pad at the top, though – it was just a set. Towards the end of 1991’s Pretty Woman, Vivian Ward (Julia Roberts) convinces Edward Lewis (Richard Gere) to take the day off from work and “cop a squat” at what is now Grand Park in Downtown Los Angeles. 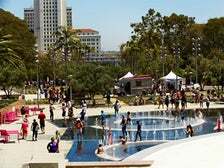 The 12-acre outdoor space was originally known as Civic Center Mall and El Paseo de los Pobladores de Los Angeles, but was renamed after undergoing a $56-million renovation in 2010. The revamped park was opened to the public in July 2012 and features a large events lawn, a smaller performance lawn, wading pool, community terrace, a Starbucks, shaded walkways, tables and chairs for outdoor dining. The spot where Vivian and Edward read Shakespeare under a tree can be found in the southeastern portion of Grand Park. The Arthur J. Will Memorial Fountain, where Vivian announces that she wants a snap dog, is located at the park’s northwest entrance. 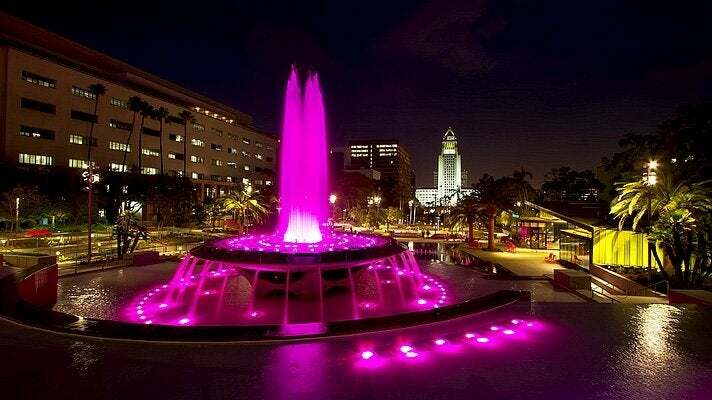 The fountain was named in honor of the chief administrative officer of the County of Los Angeles from 1951 to 1957. Though there are no hot dog vendors permanently posted at Grand Park, the space does regularly host food trucks. Grand Park also made a memorable appearance in the epic Hall & Oates You Make My Dreams Come True dance sequence from (500) Days of Summer. Some of L.A.’s most stunning vistas can be seen from the hiking trails of Runyon Canyon Park. 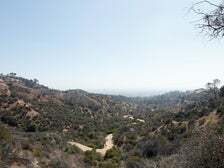 Situated in the center of Nichols Canyon, the 160-acre parcel of land that now makes up Runyon Canyon Park was at one time owned by coal baron Carman Runyon, who utilized it as a hunting and riding venue. In 1984, the City of Los Angeles acquired the acreage and subsequently turned it into a public park. Today, it is one of the most popular hiking spots in L.A. and frequently used as a filming location. The park itself has appeared in episodes of The Hills and Seinfeld and in movies like Funny People, Breathless and The Anniversary Party. Located just inside the park on a private road that is not accessible to cars (but is accessible to hikers) is a large red, barn-like home that is also a favorite of location scouts. Jennifer Jolie (Parker Posie) lived – and was terrorized – there in Scream 3. (A scale model was used for the scene in which the house is blown to pieces.) David Silver (Brian Austin Green) also called the place home for a time during the later years of Beverly Hills, 90210. Harrison Ford and Josh Hartnett investigate a murder at the property at the end of the 2003 comedy Hollywood Homicide. At the end of the 1988 comedy Twins, Julius and Vincent Benedict (Arnold Schwarzenegger and Danny DeVito, respectively) are shown enjoying a day at a carousel with their families. 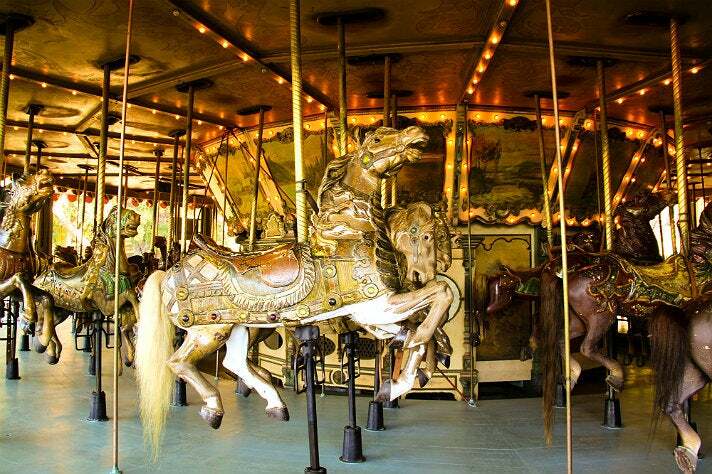 That carousel is the Griffith Park Merry-Go-Round, which was built in 1926 by the Spillman Engineering Company. The merry-go-round features 68 handmade jumping horses with authentic horse hair tails, as well as a custom-built Stinson 165 Military Band Organ. The picturesque site, which is surrounded by sprawling lawns and shaded pathways, has been featured countless times on screen. Besides Twins, it’s also popped up in Teen Witch, Buffy the Vampire Slayer, MacGyver, The Mentalist, CSI: New York, Rizzoli & Isles, Castle, Alias, Beauty and the Beast and Law & Order: L.A.
Calamigos Ranch was originally established in 1947 as a children’s camp by Navy veteran J. Grant Gerson and his wife, Helen. As more residences started popping up near what was once his rural 15-acre property, Gerson decided to take action by purchasing several adjoining plots of land. 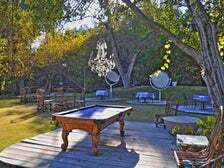 Today, Calamigos Ranch is still run by the Gerson family; it's comprised of a whopping 120 acres and is utilized mainly as a special events venue. 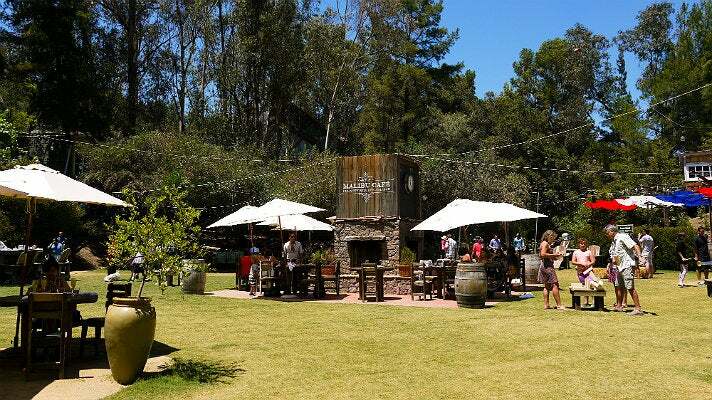 Situated at the center of the sprawling ranch is Malibu Café. Don’t let the name deceive you, though - Malibu Café is so much more than a restaurant. The outdoor site boasts: games for both children and adults, sprawling lawns, meandering pathways and trails, a large pond with paddle boat rentals, a clothing and gift boutique, several bars, chairs for lounging, outdoor fireplaces and a large eatery that offers what the Gerson family has dubbed “Nouveau Barbeque-style” fare. After dining, patrons of the café are free to wander the ranch’s vast grounds. The Huntington Library, Art Collections & Botanical Gardens originally served as the private home of railroad magnate Henry E. Huntington and his wife, Arabella. Henry purchased the property in 1902 and began cultivating incredible botanical gardens on the site two years later. Today, the 207-acre property is comprised of the couple’s former art collection (including Thomas Gainsborough’s The Blue Boy) and rare book collection (there’s a Gutenberg Bible on display), as well as 12 gardens that feature more than 15,000 different plant varieties. 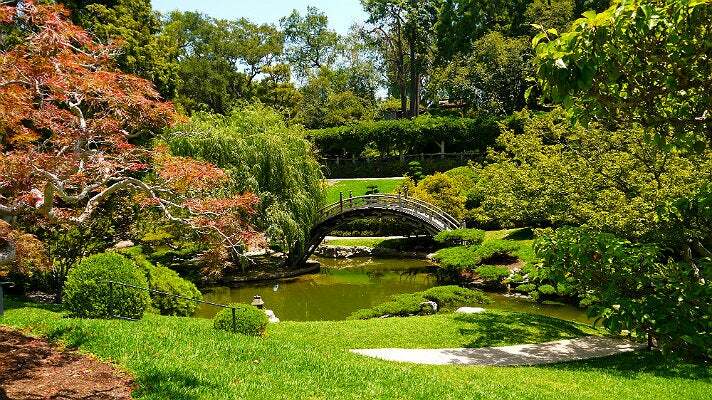 The gardens alone encompass more than 120 acres of painstakingly maintained landscapes and include a rose garden, zen garden, Japanese garden, Chinese garden, desert garden, a conservatory and a children’s garden. The Huntington is one of the most picturesque sites in all of California (it’s even featured in the book 1,000 Places to See Before You Die), so it’s no surprise that it’s appeared on screen hundreds of times. In the 1998 rom com The Wedding Singer, Adam Sandler was left at the altar at the Huntington’s sprawling North Vista lawn. The site’s Rose Garden masked as Paris, France in two Season 3 episodes of Beverly Hills, 90210 and was also where Steve Sanders (Ian Ziering) later married Janet Sosna (Lindsay Price) in Season 10. The Japanese Garden popped up in Beverly Hills Ninja as well as in Memories of a Geisha. The exteriors of the History of Science Gallery and the Boone Gallery masqueraded as The White House in First Daughter. Where else in the world can you work out alongside the ocean other than at Venice Beach, aka Muscle Beach? The outdoor space flanking Windward Avenue and Ocean Front Walk boasts a beachside gym, skate park, gymnastics facility, and courts for paddle tennis, handball, volleyball and, most famously, basketball. Thanks to the unique ocean views, the site has been featured in countless productions. Ironically, its most famous onscreen appearance was actually shot elsewhere. 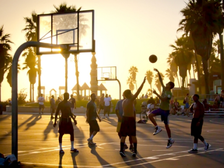 In the opening and closing scenes of the 1992 hit White Men Can’t Jump, Wesley Snipes and Woody Harrelson are shown playing basketball beachside, but because filming would have required the real life Venice courts to be shut down for too long a time period, temporary courts had to be created for the shoot in the parking lot located at Ocean Front Walk and Rose Avenue. However, the real life courts did make a memorable appearance in American History X. 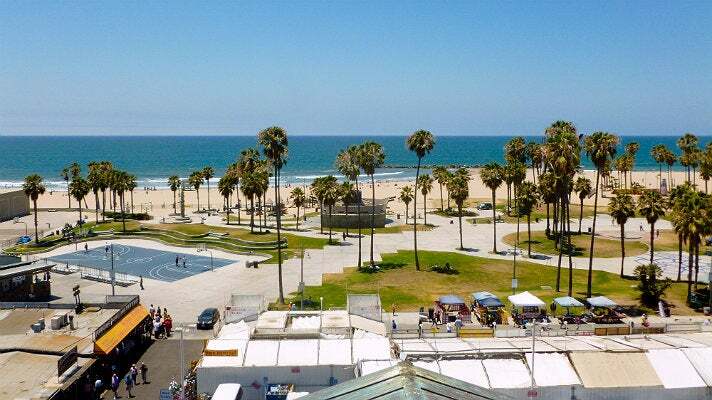 For those who want to enjoy Venice Beach without having to exercise, the same area boasts a large bustling marketplace on the boardwalk. A short walk away is the Venice Pier, where Michael Douglas meets his end in Falling Down. Mark Harmon lived at a nearby house in the 1987 summer movie classic Summer School. Sadly, his home at 2815 Ocean Front Walk was completely remodeled and is no longer recognizable. 327 S. Latigo Cyn Rd.